What’s That Floating in My Eye? Staring off into a clear blue sky, you might see random black, gray or translucent hook, rod or crescent shapes floating around. They’re there, but not really. These are eye floaters. In the vast majority of cases, they aren’t dangerous, only annoying. But eye floaters can be signs of a more serious problem if they’re accompanied by certain other symptoms. Joseph Newman, MD, Ophthalmologist – Retinal Specialist, describes eye floaters and discusses when they’re a cause for concern. “We all have a gel inside the center of our eyes called the vitreous. For everybody, as we age, this gel turns to a liquid. As it becomes more liquefied, little proteins condense out of it. As the gel liquefies, it pulls away from your retina, which is brain tissue that lines the inner part of your eye. When the gel detaches from the retina, that’s typically where you’ll see the floater,” explains Dr. Newman. Floaters are often crescent, U, rod or hook shaped. “Floaters themselves aren’t bad, but it’s good to have them checked when they first start because they could be a sign that something else might be going wrong in your eye,” Dr. Newman cautions. Most everyone will experience floaters at some point in his or her life. Dr. Newman says they’re highly common, a natural part of aging. When Should You See an Eye Specialist? At the first onset of floaters, you should have an eye exam, Dr. Newman suggests. 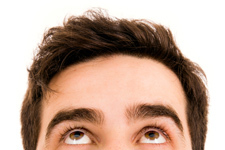 If you’ve had floaters for a while, be sure to mention that you have them at your next annual eye exam. “It’s kind of a snake of a disease, because you might have these little floaters. You might have loss of side vision or these flashes. But your eye doesn’t hurt, it doesn’t get red, so you think, ‘Ah, it’ll get better.’ It’s natural to think that,” says Dr. Newman. But even though the vast majority of floaters cause no problems, Dr. Newman advises having an eye exam to be certain you don’t have macular or retinal damage that can lead to loss of vision. If your floaters are caused by a problem with your macula or retina, the quicker your eye doctor can repair the damage, the greater the chance you will retain some or all vision. What Is the Eye Exam for Floaters Like? Indirect optoscope. Your eye doctor — an optometrist or ophthalmologist — will conduct an eye exam using a slit lamp—the little stand that you put your chin on — and an indirect optoscope. Your eye doctor will check for damage to your macula and retina. If your eye doctor has concerns, he or she may refer you to a retinal specialist, who will conduct a scleral depressed exam. Scleral depressed exam. In this slightly uncomfortable but thorough test, your retinal specialist will numb your eyes, and then use a scleral depressor (metal probe) to see the furthest extent of the peripheral retina to look for tears or to see weaknesses that set you up for having retinal tears. “Probably 99 percent of the time floaters are no big deal. Retinal detachment is 1 in 10,000 cases, and macular holes are close to that,” says Dr. Newman. What Is the Treatment for Floaters? There is no treatment for floaters, unless they’re caused by one of the more serious problems listed above. There’s no prevention either. You just get used to them. Dr. Newman stresses, however, that if you have floaters, flashes and a loss of side vision, it’s an urgent matter and you need to see an eye specialist or go to the Emergency Room immediately.